Speaker of the House of Representatives, Hon. Yakubu Dogara is currently enmeshed in a battle to clear allegations leveled against him that he spent N66 million on chartered aircraft. His aides and associates yesterday said about N3.9million was spent on an 80-minute return trip from Abuja to Delta State and that the money came from the Speaker’s pocket, not the National Assembly’s. The Speaker had over a week ago chartered a private jet to Delta State to commission a Church built by a member of the House. It was learnt that Mr. Dogara rejected the aircraft released from the Presidential Air Fleet for the trip because it was “private”. However, a few days after the trip, some House members are claiming that such “a tasty lifestyle” is not in line with Dogara’s “Legislative Agenda”. A pro-Dogara source described the insinuations as “politically motivated” because of the political intrigues presently playing out in the House. Some lawmakers queried the sources of funding such trips since the movement of the Speaker is usually bankrolled by the National Assembly. A member of the House, who spoke in confidence, said: “The chartered aircraft palaver is being circulated among House members because of the alleged N66 million cost. We do not know whether the amount was real or imaginary. But it remains in the realm of allegation. “The challenge is that he who comes to equity must do so with clean hands. With the robust Legislative Agenda put in place by Dogara, this is no time for such a luxury. The same House of Representatives joined issues with the immediate past Minister of Petroleum Resources on the charter of a Bombardier aircraft. “Dogara needs to explain to members what really transpired. No APC member is expected to indulge in this type of luxury because the party came into office with an austere agenda”. Dogara, who is said to cherish Christian ethics, is reportedly weighed down by the allegation, The NATION reports. The row over the chartered aircraft was said to have bothered Dogara, who viewed the hoopla generated by the trip as a deliberate attempt by some ‘political detractors’ to rubbish his image. Subsequently, he was said to have reached out to as many members as possible to explain that he did not dip his hands into the National Assembly’s coffers. Dogara’s aide said: “I am under instruction not to comment because it appears that those behind the allegation of N66million have another motive. 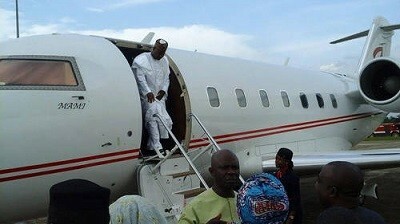 “As at the time the Speaker made the trip to Delta State, there was no commercial flight at all. “It became necessary for him to use a chartered aircraft. The cost of the service was only N3.9million for a 40-minute flight to and from Delta State. Altogether, it was 80 minutes. And the aircraft only dropped the Speaker and returned to pick him and his entourage after his church assignment. Let me also clarify that the Speaker does not own a private jet”. The post Speaker Dogara Reportedly Battling To Stave Off Accusations He Blew N66m On Chartered Private Jet appeared first on INFORMATION NIGERIA.